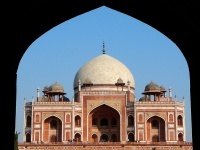 Humayun's Tomb is one of the best-preserved and most beautiful examples of Mogul architecture in Delhi, and is often seen as a forerunner of the Taj Mahal in Agra. Building started on the tomb in 1564 after the death of Humayun, the second Moghul emperor, and its construction was overseen by Haji Begum, his senior widow and the mother of Akbar. The tomb is an octagonal structure capped by a double dome that soars 125ft (38m) into the sky, and is set in a formal Persian garden. In the grounds are some other worthwhile monuments, including the Tomb of Isa Khan. Some careful restoration work has been done on some of the buildings and art but nothing important has been altered and the site has not lost its sense of authentic old age. Visiting this attraction is great for the uninitiated because it is the perfect introduction to the architecture, symbolism and importance of memorial tombs in India. For photography lovers the tomb, with its red colouring and geometric designs, is a wonderful subject. Tourist infrastructure is somewhat lacking, with only a few stalls, a tiny exhibit and no real public toilets - but, on the plus side, it is also less crowded and commercial than many other sites in the city and visitors can wander freely.